The Priolo´s Environmental Center, has a library available for visitors, with information about the Priolo, the Laurel Forest and the Azores. As well as other free information about the islands and the environment avaliable in the information desk at the center. 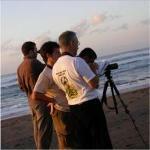 The Priolo Environmental center will organize a Volunteers Program at the ZPE. The volunteers can participate in various activities such as the collaboration in cutting and eradicating exotic vegetation fieldwork, support in monitoring the habitat, to help in the center activities and also to participate in other SPEA projects in the Azores. Get to know about our volunteering oportunities! The center organizes walks on the pathways existing inside the ZPE Pico da Vara/ Ribeira do Guilherme to watch the Priolo and discovering its habitat. This walks are guided by the center staff and the participants receive the adequate equipment to do bird watching, and information about the ZPE flora and fauna. It is expected the commemoration of important dates for Environment and Nature. Get to know our winter activities! The Priolo’s Environmental center will have an annual program for the schools. This Program will include activities to take place at schools, inside the Program “O Priolo vai a tua escola” (“The Priolo goes to your school”) and inside the center, “A tua escola visita ao Priolo” (“Your school visits the Priolo”). 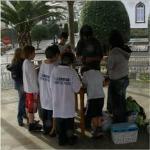 We will also organize annually an scholar award with topics related to the Priolo and the Laurissilva, and we will promote activities in collaboration with schools, that will proportionate the children the opportunity of contact with the nature and collaborate directly with the conservation of the Priolo and the Azorean Laurissilva. Moreover, we will teach courses about topics related to the Priolo, the environment, the nature and the sustainable development, in collaboration with different institutions. The center pretends to promote various economical sustainable activities that could be developed in the region trough the sale of artesian products and local food products, at the Priolo Shop and the Bar, and by the organization of courses with the idea of promoting the sustainable development of the region.